A controversial painting that made headlines earlier this year is now the subject of a lawsuit in a federal court in Washington, D.C., but constitutional experts predict the plaintiff’s free speech arguments are doomed. The case hinges on whether an art competition held by members of Congress qualifies as “government speech,” which has less protection under the First Amendment. The legal feud has roiled emotions in Washington and across the nation, mostly due to public bickering between lawmakers over a painting’s portrayal of police brutality. The lawsuit features intriguing free speech arguments, but a 2015 Supreme Court rulingupholding Texas’ right to prohibit the display of the confederate flag on a commemorative license plate probably undercuts any chance of success, experts said. “[The case] sounds like a test question from a First Amendment law school class,” mused Trevor Burrus, a fellow at the libertarian Cato Institute’s Center for Constitutional Studies. U.S. District Senior Judge John Bates of the District of Columbia noted in a decision in the case last week that “the government speech doctrine is still evolving, and it is not entirely clear how courts should distinguish between non-public forums and government speech.” The artist and his congressman plan to appeal the judge’s decision, which found the painting’s removal from the halls of Congress did not violate the First Amendment. David Hudson, a Vanderbilt law professor and First Amendment Ombudsman at the Newseum Institute’s First Amendment Center, said the U.S. Supreme Court’s ruling in Walker v. Sons of Confederate Veterans expanded the areas that can be considered government speech. The high court in that case ruled 5-4 that license plates are government speech, not private speech, giving the state authority to decide what images or messages are allowed on them. Hudson said it’s unlikely a court will look at a congressional art competition differently. “If license plates are now government speech, then winning a competition and hanging something in the Capitol is government speech,” Burrus said, though he added, “I think they’re both kind of dumb.” Burrus filed briefs against Texas in the license plate case. The painting’s creator, David Pulphus, was chosen as a winner in the 2016 Congressional Art Competition from Democrat Rep. William Lacy Clay’s Missouri district. It was hung in the Capitol with other winning pieces last June. 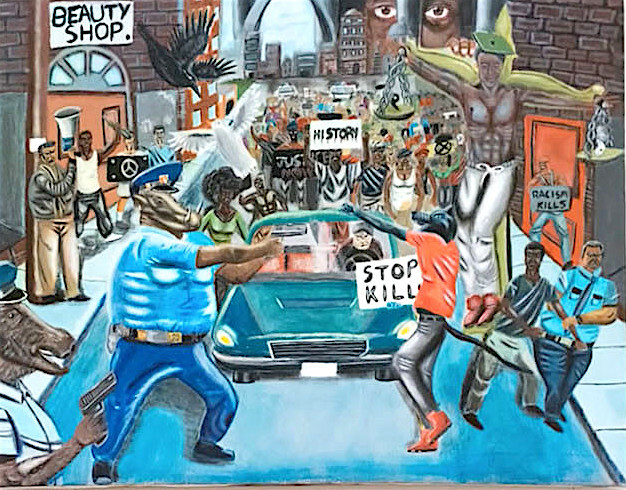 The painting depicts a confrontation between police and protesters on the street, and two officers in the forefront have the heads of pigs or warthogs. The architect of the Capitol, Stephen Ayers, authorized the removal of the painting in January, after several Republican lawmakers complained it was anti-police, and even tried to remove it themselves. Pulphus and Clay alleged the lawmakers and Ayers deprived Pulphus of his right to free expression. They’re represented pro bono by a bench of high-profile lawyers, including Jenner & Block’s Leah Tulin, Harvard Law professor Laurence Tribe, University of California, Irvine’s Erwin Chemerinsky, James Williams of Chehardy Sherman Williams and Kymberly Evanson from Pacifica Law Group. With the art exhibit in the Capitol set to come down May 1, George Washington University Law School Associate Dean Alan Morrison said it’s not likely the appeals court would rule on the case. That’s because it’s often difficult to tell if a government entity is speaking for itself, or opening up a public forum for private entities to speak. Courts must consider whether the medium at issue is traditionally used by the government to communicate messages, whether the public reasonably interprets the government to be the speaker, and whether the government maintains editorial control over the message. Tulin said the district judge erred in his decision, because though Ayers retained “editorial control” over the art competition, he never exercised it with respect to a submission’s viewpoint before the removal of this painting. Tulin added that the case would still have significance after May 1 because winning pieces are featured on congressional websites and the artist is a student who wants to be able to list the win on his resume. She declined to say when the appeal would be filed. Be the first to comment on "Capitol painting won’t prevail on appeal"